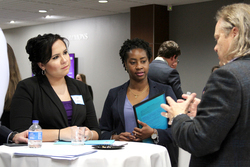 Stephen F. Austin State University students, pictured from left, Dani Castillo, human resource management major from Pearland, and Kareene Telesford, a graduate accounting student from Grenada, meet with Mike Parham from Pepco Sales and Marketing at the recent College to Career Conference employer reception. During the conference, SFA alumni and industry professionals from more than a dozen companies shared their expertise with current Rusche College of Business students. NACOGDOCHES, Texas - Stephen F. Austin State University alumni and industry professionals from more than a dozen companies recently shared their expertise with current Rusche College of Business students during the fifth annual College to Career Conference at SFA. This conference serves as the annual capstone highlight for business students in the Career Success Passport Program, formerly the Student Success Passport Program. This program helps students hone their professional skills while competing for scholarships. "This event allows our students to practice the career preparation skills they've learned through our unique passport program," said Gina Small, academic advisor and career success specialist in the college. "It also offers all SFA students the opportunity to learn from experts in the field." Throughout the day, students attended workshops covering a variety of business-related topics and learned best practices for entering the workforce, including how to dress professionally, how to stand out from the competition and what to expect in the first 100 days on the job. Students also participated in one-on-one résumé critiques and discussed personal and professional branding. Dr. Tim Bisping, dean of the Rusche College of Business, said this year's conference was a success. "We have seen continued growth in both employer and student participation, making this year's conference perhaps the largest in the event's history," he said. Alumni served as panelists in various workshops to share their business knowledge and career journey. Kirk Phillips, president and chief executive officer of Wintrust Commercial Finance, discussed the equipment leasing and financial industry and career options. Representatives from Austin Bank, Lockheed Martin, Commercial Bank of Texas, Wells Fargo, Southwest Airlines, Walgreens, Rockwall Automation, Pepco Sales and Marketing, Kovar Capital, Kohls, Southside Bank, Wintrust Commercial Finance, Tom F. Pruitt and Reynolds/Reynolds were present. "This event gives our students a chance to hear from successful friends of the college regarding current professional development issues while also giving students networking opportunities with individuals who may recruit them for future employment," Bisping said. "The C2C event is one way in which we can help our students gain an edge in the job market." Selected students also attended an employer reception in the Mattress Firm Commons to talk with panelists in a more personal setting. "The employer reception gives our students a great opportunity to network with business professionals," Bisping said. "It allows our students to hone their networking skills in a supportive environment. As we work to help our students launch successful careers and become leaders in their fields, this skill development is vitally important."